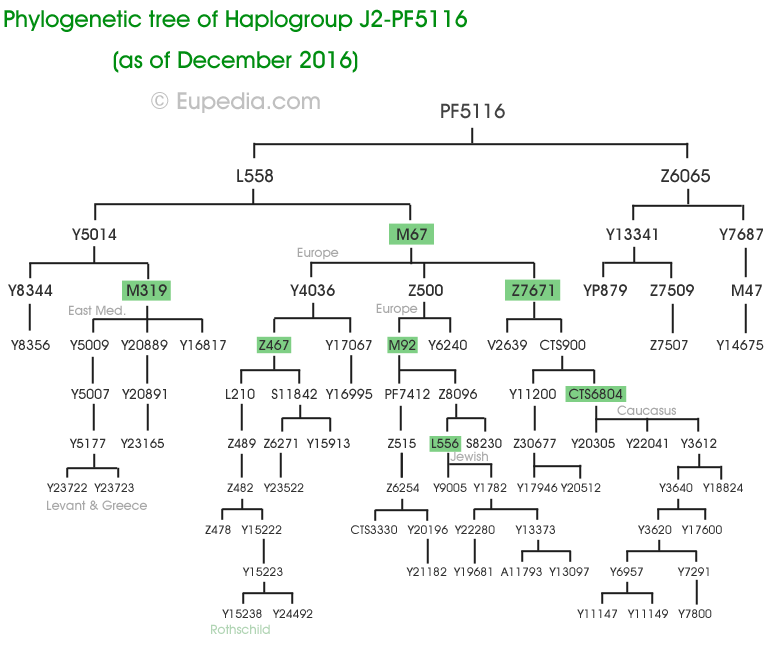 Haplogroup J2 is thought to have appeared somewhere in the Middle East towards the end of the last glaciation, between 15,000 and 22,000 years ago. The oldest known J2a samples at present were identified in remains from the Hotu Cave in northern Iran, dating from 9100-8600 BCE (Lazaridis et al. 2016), and from Kotias Klde in Georgia, dating from 7940-7600 BCE (Jones et al. (2015)). This confirms that haplogroup J2 was already found around the Caucasus and the southern Caspian region during the Mesolithic period. The first appearance of J2 during the Neolithic came in the form of a 10,000 year-old J2b sample from Tepe Abdul Hosein in north-western Iran in what was then the Pre-Pottery Neolithic (Broushaki et al. 2016). 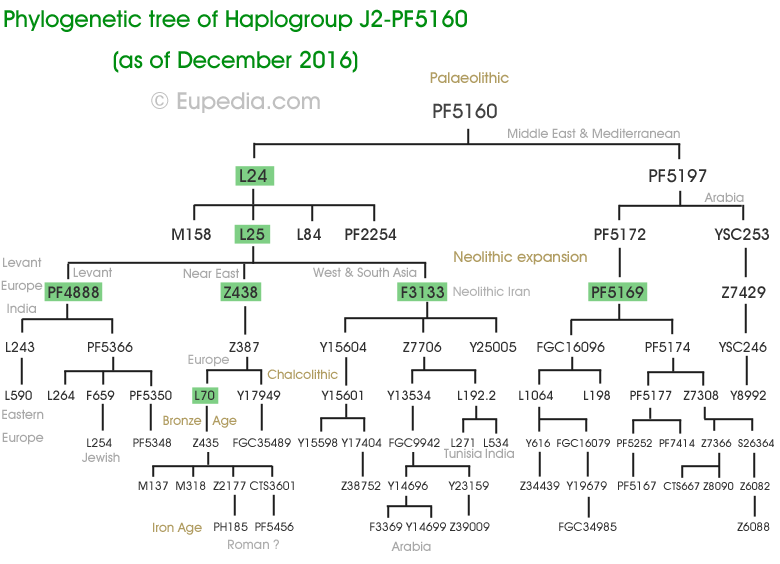 Notwithstanding its strong presence in West Asia today, haplogroup J2 does not seem to have been one of the principal lineages associated with the rise and diffusion of cereal farming from the Fertile Crescent and Anatolia to Europe. It is likely that J2 men had settled over most of Anatolia, the South Caucasus and Iran by the end of the Last Glaciation 12,000 years ago. It is possible that J2 hunter-gatherers then goat/sheep herders also lived in the Fertile Crescent during the Neolithic period, although the development of early cereal agriculture is thought to have been conducted by men belonging primarily to haplogroups G2a (northern branch, from Anatolia to Europe), as well as E1b1b and T1a (southern branch, from the Levant to the Arabian peninsula and North Africa). Mathieson et al. (2015) tested the Y-DNA of 13 Early Neolithic farmers from the Barcın site (6500-6200 BCE) in north-western Anatolia, and only one of them belonged to haplogroup J2a. Lazaridis et al. (2016) tested 44 ancient Near Eastern samples, including Neolithic farmers from Jordan and western Iran, but only the above-mentioned sample from Mesolithic Iran belonged to J2. Likewise, over 100 Y-DNA samples have been tested from Neolithic Europe, covering most of the important cultures, and only two J2 sample was found, in the Sopot and Proto-Lengyel cultures in Hungary, dating from 7,000 years ago. J2 was also absent from all Chalcolithic and Bronze Age Indo-European cultures, apart from one J2a1b sample in Hungary dating from the end of the Bronze Age (c. 1150 BCE, see Gamba et al. 2014), in the minor Kyjatice culture, an offshoot of the Urnfield culture, which differs from typical Indo-European cultures by its use of cremation instead of single-grave burials. No Neolithic sample from Central or South Asia has been tested to date, but the present geographic distribution of haplogroup J2 suggests that it could initially have dispersed during the Neolithic from the Zagros mountains and northern Mesopotamia across the Iranian plateau to South Asia and Central Asia, and across the Caucasus to Russia (Volga-Ural). The first expansion probably correlated with the diffusion of domesticated of cattle and goats (starting c. 8000-9000 BCE), rather than with the development of cereal agriculture in the Levant. A second expansion would have occured with the advent of metallurgy. J2 could have been the main paternal lineage of the Kura-Araxes culture (Late Copper to Early Bronze Age), which expanded from the southern Caucasus toward northern Mesopotamia and the Levant. After that J2 could have propagated through Anatolia and the Eastern Mediterranean with the rise of early civilizations during the Late Bronze Age and the Early Iron Age. The world's highest frequency of J2 is found among the Ingush (88% of the male lineages) and Chechen (56%) people in the Northeast Caucasus. Both belong to the Nakh ethnic group, who have inhabited that territory since at least 3000 BCE. Their language is distantly related to Dagestanian languages, but not to any other linguistic group. However, Dagestani peoples (Dargins, Lezgins, Avars) belong predominantly to haplogroup J1 (84% among the Dargins) and almost completely lack J2 lineages. Other high incidence of haplogroup J2 are found in many other Caucasian populations, including the Azeri (30%), the Georgians (27%), the Kumyks (25%), and the Armenians (22%). Nevertheless, it is very unlikely that haplogroups J2 originated in the Caucasus because of the low genetic diversity in the region. Most Caucasian people belong to the same CTS6804 subclade and share a common patrilineal ancestor who lived some 7,500 years ago, at the time of the Neolithic expansion to the Caucasus. The Chechens and Ingushs belong almost exclusively to the Y7800 clade, which formed only 2,000 years ago and has a TMRCA of approximately 1,500 years. The high local frequencies observed would rather be the result of founder effects, for instance the proliferation of chieftains and kings's lineages through a long tradition of polygamy, a practice that the Russians have tried to suppress since their conquest of the Caucasus in the 19th century. Outside the Caucasus, the highest frequencies of J2 are observed in Cyprus (37%), Crete (34%), northern Iraq (28%), Lebanon (26%), Turkey (24%, with peaks of 30% in the Marmara region and in central Anatolia), Greece (23%), Central Italy (23%), Sicily (23%), South Italy (21.5%), and Albania (19.5%), as well as among Jewish people (19 to 25%). One fourth of the Vlach people (isolated communities of Romance language speakers in the Balkans) belong to J2, considerably more than the average of Macedonia and northern Greece where they live. This, combined to the fact that they speak a language descended from Latin, suggests that they could have a greater part of Roman (or at least Italian) ancestry than other ethnic groups in the Balkans. J2a1-M67 is the most common subclade in the Caucasus (Vainakhs, Ingushs, Chechens, Georgians, Ossetians, Balkars) and in the Levant (Lebanese, Jews). It is also common in western India, the Arabian Peninsula, Anatolia (esp. north-west), Greece (esp. Crete), Italy (esp. Marche and Abruzzo) and Iberia. M67 was probably a major Bronze Age lineage expanding from the Caucasus to Greece to the west and the Indus valley to the east. J2a1-M68 is a minor subclade found in Iraq and India. J2b1-M205 is found especially in the western Balkans, Cyprus, the Levant, the South Caucasus and Iran. It is very likely that J2a, J1-Z1828, L1b, T1a-P77 and G2a-L293 were the dominant male lineages the Early Bronze Age Kura-Araxes culture (3,400-2,000 BCE), which expanded from the South Caucasus to eastern Anatolia, northern Mesopotamia and the western Iran. From then on, J2 men would have definitely have represented a sizeable portion of the population of Bronze and Iron Age civilizations such as the Hurrians, the Assyrians or the Hittites. It is very possible that bronze technology spread from the South Caucasus across the Iranian plateau until the Indus Valley, giving rise to the Harappan Civilisation (see below). The Minoan civilisation emerged from 2,700 BCE and could have been founded by colonists from the Kura-Araxes culture who would have brought bronze working with them. Modern Cretans have the highest percentage of G2a (11%), J1 (8.5%), J2a (32%), and L + T (2.5% together) in Greece (and the highest percentage of J1 and J2a in all Europe for that matter), the three haplogroups associated with the Kura-Araxes culture. Although little data is available at present about deep clades in Crete or Aegean Greece, the parts of Italy that were colonised by Ionic and Doric Greeks, notably Sicily, Calabria and Basilicata, possess substantial percentages of typically Caucasian haplogroups, such as G2a-L297, J1-Z1828 and J2a-L581, as well as considerable levels of Middle Eastern and Caucasian autosomal admixture by European standards. In fact, it seems that many branches of J2a (e.g. M319, Z7671, F3133, Z6046, L581) may have expanded from the South Caucasus from the Chalcolithic onwards. The presence of these haplogroups and admixtures in southern Italy almost certainly represent Kura-Araxes ancestry inherited from Minoan Greeks from the Aegean islands. The Phoenicians, Jews, Greeks and Romans all contributed to the presence of J2a in Iberia. The particularly strong frequency of J2a and other Near Eastern haplogroups (J1, E1b1b, T) in the south of the Iberian peninsula, suggest that the Phoenicians and the Carthaginians played a more decisive role than other peoples. This makes sense considering that they were the first to arrive, founded the greatest number of cities (including Gadir/Cadiz, Iberia's oldest city), and their settlements match almost exactly the zone where J2 is found at a higher frequency in southern Andalusia. The high incidence of J2a in Italy is owed in great part to the migration of the Etruscans from western Anatolia to central and northern Italy, and to the Greek colonisation of southern Italy. However both the Etruscans and Greeks would have carried many other Y-DNA lineages, including G2a, J1, R1b-Z2103, T1a, and probably also E-M34. J2a levels would have been higher among the Greeks than the Etruscans, and particularly among the insular Greeks that colonised Magna Graecia. Immigration from the eastern Mediterranean to Rome during the Roman Empire, then from Anatolia, Thrace and Greece during the Byzantine period (particularly in north-eastern Italy) further increased the incidence of J2 in the peninsula. Several common Italian J2a subclades are found mainly in the south of Italy (M319, M92, Z467, Z7671, all under L558) and are likely to be of Greek origin. The highest concentrations of J2a in Europe are found in Crete (32% of the population) and Calabria (26%). M319, one of the principal J2a1 subclades in Greece, Italy and Western Europe, reaches is maximum frequency in Crete (6-9%). The Romans probably helped spread haplogroup J2 within their borders, judging from the distribution of J2 within Europe (frequency over 5%), which bears an uncanny resemblance to the borders of the Roman Empire (once concessions are made for the Germanic invasions that appear to have lowered the frequency of J2 between Belgium and Switzerland). There is a high diversity of J2a in Italy, but the most common branch found all over the peninsula and therefore most likely linked with a Roman diffusion is L70, and particularly its subclade Z435. All L70 carriers today descend from a single patrilineal ancestor who lived about 5,000 years ago. This corresponds to the time when the Proto-Indo-Europeans started invading Central Europe from the Pontic Steppe. It is not yet clear where J2-L70 was located at the time. It could have been present in the Steppe and tagged along the predominantly R1b branch of the Proto-Indo-Europeans that moved to the Balkans and Central Europe. Or it could have been one of the lineages of Chalcolithic Southeast and Central Europe. A third alternative is that L70 originated in Anatolia or Greece and moved to Italy with the migration that gave rise to the Etruscan civilisation. Z435 was formed about 3,600 years ago and has a TMRCA of only 3,100 years (± 300 years). The latter corresponds roughly to the timing of the invasion of Italian peninsula by Italic tribes from the Alps. Z435 has numerous subclades of its own, and most have been identified in central Italy. This could either mean that Z435 was one of the founding Italic lineages, or that it was already in Italy and was assimilated by the Italic tribes. The PF5456 subclade is barely 2500 years old, and would have emerged and propagated after the founding of Rome. Outside Italy, it is now found in such varied places as Portugal, Spain, France, Britain, Belgium, southern Germany, Austria, Bulgaria, Tunisia or Lebanon, all regions colonised by the Romans. Z2177, another subclade of Z435, is a bit under 3,000 years old. It has various subclades of its own which are scattered today around Italy (northern Italy, Tuscany, Latium, Sicily, Sardinia) and in places like Switzerland, south-west Germany, Britain, Spain, Romania, Greece, Turkey and Syria - also all these regions were part of the Roman Empire. Italy has by far the highest concentration of Z2177 of any country. Within the Indian subcontinent, J2a peaks at frequencies of 15-25% around the Indo-Pakistani border, from Punjab to Gujarat and Sindh. This region matches exactly the confines of the Bronze Age Indus Valley Civilization, also known as the Harappan Civilisation, that existed from 3300 BCE to 1300 BCE and which practised bull worship like other J2a civilizations. Bronze started being used by the Harappan Civilization circa 3000 BCE, a few centuries after its earliest known regular use around the Caucasus by the Maykop culture (from 3700 BCE) and the Kura–Araxes culture (from 3500 BCE). While the Maykop culture was closely linked to the Yamnaya culture in the Pontic-Caspian Steppe and is thought to be associated with Proto-Indo-European speakers and Y-haplogroups R1a and R1b, the Kura-Araxes culture would have allowed the diffusion of Y-haplogroup J1 and J2a around the Middle East, taking over the Neolithic societies primarily associated with Y-haplogroup G2a and G2b. Archeological evidence of a massive migration from the southern Caucasus to the Indus Valley is elusive at present, but it cannot be excluded as it has been proven now that large-scale Indo-European migrations took place during the same period from the Pontic-Caspian Steppe to Europe and Central Asia. There is no reason to believe that J2a people from the Kura-Araxes culture couldn't have expanded in the same way westward toward Anatolia, Greece and Italy and eastward to Iran, southern central Asia, Pakistan, India. There is another cluster of J2a with a frequency approximating 15% in Bactria, in southern-central Asia, in what is now northern Afghanistan, eastern Turkmenistan, southern Uzbekistan and western Tajikistan. This region corresponds to the Bactria–Margiana Archaeological Complex (BMAC), also known as the Oxus civilization, which flourished between 2300 and 1700 BCE. Oxen were used to draw wheeled carts and camels were domesticated in this region c. 2500 BCE, just before the start of this civilization. The BMAC was eventually overrun by the Indo-Iranian migrations from the Andronovo culture and the Sintashta culture further north, and became Indo-Europeanized. The Indo-Aryans pursued their southward expansion, invading northern Pakistan and northwest India from 1800 BCE to 1500 BCE, and eventually bringing about the demise of the Indus Valley Civilisation around 1300 BCE. There is a wide variety of J2a branches found in South Asia. Some are over 10,000 years old (CTS6002, F3133, M68, M319, PF5174, Z6065) could have migrated from West to South Asia during the Neolithic, Chalcolithic or Early Bronze Age. Based on their phylogeographies, F3133 and M319 could be associated with the Kura-Araxes expansion. Y21500 has a TMRCA of 3700 years and is also found in Russia, which suggests an Indo-Aryan origin - perhaps one of the J2a1 subclades assimilated by R1a invaders in Central Asia before conquering the Indian subcontinent. A few much younger clades are also found in western India and Pakistan, such as L534 (TMRCA 2,800 ybp) and YSC246 (TMRCA 1,750 ybp) and would have come to India in historical times, for example with the Mughals. Today J2b1 is most common in the western Balkans (Serbia, Bosnia, Croatia) and Cyprus. It is also found in above 1% of the population in parts of southern Italy (Calabria, Apulia), the Peloponnese in Greece, Lebanon, Jordan, eastern Turkey, Armenia and Iran. The oldest samples recovered so far were from Early Bronze Age Jordan (c. 2400 BCE, Lazaridis et al. (2016)) and Late Bronze Age Lebanon (Canaanite burial from Sidon, Haber et al. (2017)). It was also found in an Egyptian mummy (c. 660 BCE, Schuenemann et al. (2017)). J2b1's origins remain unclear, but it probably originated in the South Caucasus and/or Iran and might have spread to the Levant, Cyprus and Greece with the Kura-Araxes culture during the Bronze Age. The branch found in the western Balkans (Y22069) is distinct from the East Mediterranean and Caucasian branch. It seems to have formed 6,000 years ago, but its TMRCA is very young at 900 years before present, suggesting a medieval founder effect. J2b has a quite different distribution from J2a. At first sight, the modern distribution of J2b seems to have a stronger association with the Neolithic and Chalcolithic cultures of Southeast Europe. Yet, at present, J2b has never been found in Neolithic, Chalcolithic, nor even Bronze Age Europe, nor in the Fertile Crescent during the Neolithic or Chalcolithic. J2b is also absent from western and central Anatolia, but is present in eastern Anatolia and western Iran, as well as in the Volga-Ural region, notably among the Mordvins, Chuvashs and Tatars. The oldest known J2b sample comes from the Pre-Pottery Neolithic site of Tepe Abdul Hosein in western Iran, dating from approximately 10,000 years ago. This is the strongest evidence that J2b actually originated in the mountains of the Zagros or the Caucasus, rather than in the plains of the Fertile Crescent. 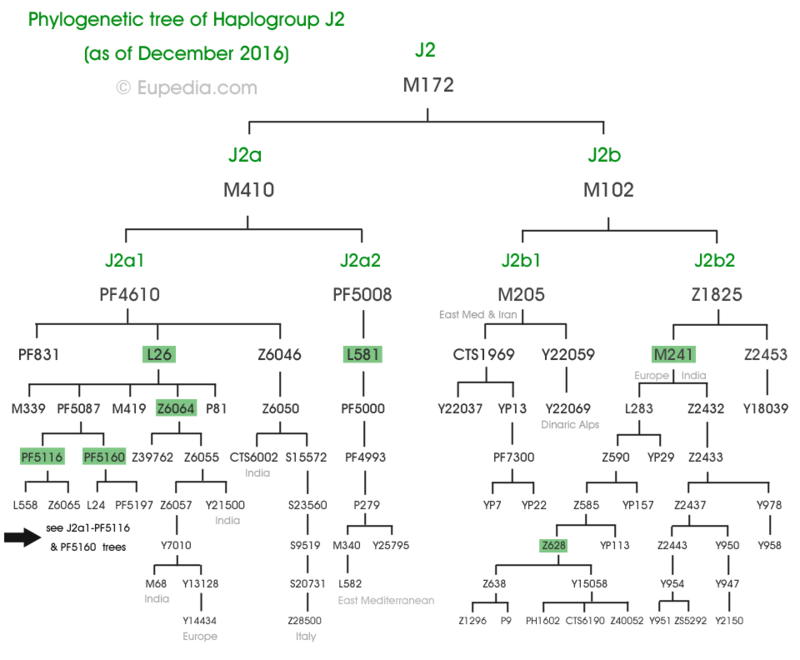 The vast majority of J2b lineages belong to J2b2 and its subclades. While J2b* and J2b1 lineages are mostly restricted to the Caucasus, eastern Anatolia and the Balkans, J2b2 is found throughout Europe, in the Pontic-Caspian Steppe, in Central Asia and in South Asia, particularly in India. Although J2b2 itself was formed 14,000 years ago, almost all European J2b2 members belong to the L283 branch and share a common patrilineal ancestor who lived 6,000 years ago. What's more, 99% of them fall under the Z628 (aka Z597) clade, with a shared common ancestor who lived only 4,500 years ago. This Z628 clade is also found in India, Armenia and the Levant, among others. The most likely hypothesis is that J2b2a1 (L283) penetrated into the Pontic Steppe region during the Neolithic or Chalcolithic period, by crossing the Caucasus from western Iran, then migrated to the Volga-Ural region, where it was absorbed by the R1a-Z93 tribes in the Early Bronze Age. As a minor lineage within the R1a-Z93 dominant populations, it would have expanded from the Volga-Ural region to Central and South Asia with the Indo-Aryan invasions approximately from 4,300 to 3,500 years ago. Other J2b lineages could have ended up in the Balkans during a number of Steppe invasions from the Bronze Age until the Middle Ages. Another conceivable possibility is that a minority of J2b2-L283 accompanied R1b-M269 from the Caucasus region and migrated to the Volga-Ural region in the early Bronze Age, propagating with them the Proto-Indo-European language and bronze technology to the Caspian steppe before the expansion of this new culture to Central and South Asia. The drawback of this hypothesis is that it doesn't explain why R1b lineages strongly outnumber J2b2 in Europe but not in South Asia. The oldest J2b2-L283 sample recovered among ancient DNA samples is a Late Bronze Age (1700-1500 BCE) individual from southern Croatia (Mathieson et al. 2017). His genome possessed about 30% of Steppe admixture and 15% of Eastern Hunter-Gatherer, which suggest a recent arrival from the Steppe. He was accompanied by a woman with similar admixtures, and both possessed typical Pontic-Caspian Steppe mtDNA (I1a1 and W3a). The timing, location and admixtures of these samples fit with the Illyrian colonisation of the Dinaric Alps, which is thought to have taken place between 1600 and 1100 BCE. The Illyrians may have been late Steppe migrants from the Volga region that were forced out of the Steppe by the invasion of the northern R1a tribes who established the Srubna culture (from 2000 BCE). Through a founding effect, J2b2-L283 lineages might have considerably increased their original frequency after reaching Illyria. Both J2b1 and J2b2-L283 are also found at high frequency in Greece and in regions that used to be part of the ancient Greek world (Ionia, Magna Graecia). However they are almost absent from Crete (where J2a1 lineages are dominant). J2b was also not found among Neolithic Anatolian or European farmers, and is absent from central Anatolia. This suggests that J2b was not associated with the Neolithic Greeks nor with the Minoan civilisation, but may well have come to Greece with the Mycenaeans, who also appear to have been pushed out of the Steppe by the advance of the Srubna culture. As a result, both the Illyrians and the Mycenaeans (and possibly the Albanians) would be descended from Middle to Late Bronze Age Steppe migrants to the Southeast Europe, in a migration that was particularly rich in J2b lineages from the Middle Volga region. That would explain why it has been so hard to identify R1a or R1b lineages that could be of Illyrian or Mycenaean origin. The only variety of R1b that is found at reasonably high frequencies in Southeast Europe, and particularly in Greece, is R1b-Z2103, the branch found in the eastern Yamna culture, including the Volga-Ural region. The other main J2b2 subclade is Z2432, which split from L283 some 10,000 years ago, during the Early Neolithic. This branch is found almost exclusively in South Asia today, apart from a few reported samples from the Middle East (Syria, Iraq, Arabian peninsula, Egypt). In all likelihood it represents the descendants of Iranian Neolithic farmers toward the Indian subcontinent, although it can't be ruled out at present that some clades migrated later from Iran, during the Chalcolithic period or the Bronze Age. The Earls of Eglinton, a Scottish noble family descended from Hugh Montgomerie, 1st Earl of Eglinton (c. 1460–1545), belongs to haplogroup J2a1-Y22056 (aka Z40262) according to FTDNA Montgomery DNA Project. Their deep clade is downstream of Y7010 and Y14434. The clade's most recent common ancestor lived approximately 550 years ago, and might correspond to Alexander Montgomerie (died 1470), 1st Lord Montgomerie. The Rothschild family, who established an international banking business, acquired the largest fortune in modern world history and established a true dynasty in the 19th century, apparently belonged to haplogroup J2a1-Y23457 (under M67, Z467 and Y15238) based on the results from the Rothschild DNA Project and of the J2-M172 Haplogroup Research. John Curtin (1885-1945), the 14th Prime Minister of Australia from 1941 to 1945, was identified as a member of haplogroup J2a1-F3133 by the Curtin Clan Y-DNA Project. The Curtin family belongs to the deep clade Y14698 (aka FGC9962), downstream of Z7706 and Y14699. John Field (subclade J2b-Z8429): as a proto-Copernican English astronomer at the court of Elisabeth I. His works were the first in England in which the principles of the Copernican philosophy were recognised and asserted. Friedrich Engelhorn (subclade J2a): was a German industrialist and founder of BASF in 1865. John Lorimer Worden (subclade J2b2): was a U.S. rear admiral who served in the American Civil War. He commanded Monitor against the Confederate vessel Virginia (originally named Merrimack) in first battle of ironclad ships in 1862. The Younger brothers (subclade J2a1h2a1-FGC24630): Cole, Jim, John, and Bob Younger were notable members of the 19th-century James-Younger gang of American outlaws, which also included Jesse James. Their paternal haplogroup was identified by the Younger DNA Project based on the results of five participants with solid genealogical records. Their deep clade is downstream of L25 > L70 > Z2177 > PH185. Sir John Anthony Pople (subclade J2b1a-YP13): was a theoretical chemist, who was awarded the Nobel Prize in Chemistry in the year 1998. Jalal Talabani (J2a1-Z438) : was an Iraqi Kurdish politician who served as President of Iraq from 2006 to 2014, as well as the President of the Governing Council of Iraq. He was the first non-Arab president of Iraq. Dzhokhar Dudayev : was a Soviet Air Force general and Chechen leader, the first President of the Chechen Republic of Ichkeria, a breakaway state in the North Caucasus. His son tested positive for J2a1-M67 and probably belongs to the Z7671 clade. Nicholas M. Donofrio : was the Executive Vice President of Innovation and Technology at the IBM Corporation until 2008. Dr. Mehmet Oz (subclade J2a1b): a Turkish-American cardiothoracic surgeon, author, and television personality hosting the The Dr. Oz Show. Matt Lauer : an American television journalist best known as the host of NBC's The Today Show since 1996. Alexander Zhulin : is a Russian ice dancer who won the 1993 World championship, and the 1993 European championship, as well as two Olympic medals (1994 silver, 1992 bronze). A. J. Jacobs : is an American journalist, author, and lecturer best known for writing about his lifestyle experiments. He announced on the Dr Oz show that he belonged to haplogroup J2.